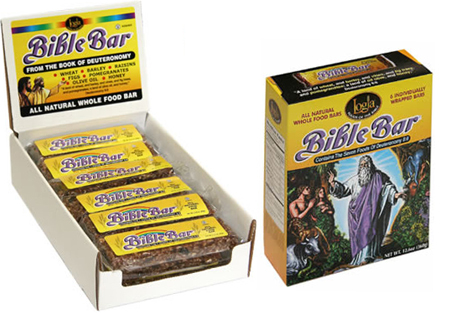 Personally, I need no biblical command to make me get stuck into a sweet snack, but for those who can't even fart unless the Bible tells them so, here's the Bible Bar, containing seven ingredients authorised by the Book of Deuteronomy, no less. And here are those kosher ingredients: "For the Lord your God is bringing you into a good land, a land of wheat and barley, of vines and fig trees and pomegranates, a land of olive oil and honey" (Deuteronomy 8:7-8). Logia Foods of the Bible, the makers of the Bible Bar, tediously explain: "God obviously had some very important reasons for linking these seven foods to the Promised Land. Therefore, when you eat a Bible Bar you are consuming the seven foods that God called good and in a form that is easy, convenient, and delicious." Sample this sanctified snack here. The special 6-bar box is just $10.77! Blessings be upon Richard Bromley for reminding us of the Bible Bar.